Trucks, cars, golf, fishing, girls, computers, electronics, cell phones, tablets, music, sound systems. I would think with 2,000 trucks on their lot you should be able to make a deal. They have 110 AT4s listed and over half of them are between $9,500 and $12,500 off msrp before any rebates, incentives or finance deals, so that beats the ad you saw. Worst deal on an AT4 available on their site is $9,338 off msrp. I can fly all the way across the country for $500 or less, and one way to STL for under $200, sometimes under $100 with Southwest, so yes it would be worth my time, but as I said YMMV. Get your best local deal in writing and ask Laura to beat it. I don’t work for them and never have but know lots of people get great deals there and all were happy with their experience. Good luck! I know other volume dealers, where are you located? It can be their best day ever but the point is if you walk out w/o signing anything they know their chances go down significantly that you return tomorrow. “Never let them leave!” is their moto. Everyone has a story like yours and/or one where the salesman chased after them as they are leaving with a “new” deal directly from the sales manager, but you must sign tonight, even the salesman has never seen a deal this good. BS, no you don’t have to make a deal tonight. If you go back in on Monday they will probably try to start over with “their deal” but don’t let them fool you and don’t be afraid to walk out again if you don’t get your deal, but don’t be rude about it, nothing good can come from being an A-hole. They are going to work you over on the WT trade one way or another because all other deals, rebates, incentives, etc will be the same until next month. I am not a fan of making demands on the seller, be nice to them and they will want to be nice back, it is just human nature. Sure they want you to think they are doing you a favor by selling you a car and make you feel good about it, that IS their job. If they try to take me for a sucker, they lose as I walk out, but leaving the door open to walk back in and make a deal later if I like. If you demand 5 minutes or else they have seen this many times before and know how to handle you, yes sales may be down but they are very rarely so desperate to make a deal that they let anyone who demands such a bad deal for them that they will just fold and give in to whatever terms you demand, it just does not work that way. They can always wait for the next mark to come in 5 minutes later and take a pass on a bad deal. Car sales industry has not changed since Sen Mike Monroney from Oklahoma got the uniform MSRP law passed 60 years ago. I have in and out some aspect of the business for most of those years. Good luck! Dave Pusa is great guy at Laura Buick GMC in St Louis. Hundreds of 2019 Sierras at up to over $14,000 off msrp with or w/o trade or finance. They pick you up at STL airport and you can drive away in your new truck in under 2 hours if you set it all up in advance. Laura is largest volume GMC truck dealer in USA for a reason. Love their Lifted trucks, ATAs and Denali deals. Tell Dave that Mike from Columbus, Ohio and Russ from Chicago sent you for the best deal possible. Don’t mention Rudy from Chicago who didn’t buy and regrets it. Laura won’t be beat and you won’t need to haggle. If you don’t buy they will not hassle you with phone calls or emails, either you want the best deal on the best truck you can buy or you don’t. Check their website. YMMV good luck! Are any of you using Auto Stop/Start to measure the mileage? Have you compared both with and without Auto S/S on same road, length and weather conditions? Highway or off-road prolly not gonna matter much but city with some combo driving is what I do most. The car numbers suprised me much more than the truck numbers but I did not read the entire article, mostly just looked at the lists and wondered what number of these people sold after one year just to buy another one exactly like it but a year newer model, such as my father did with his Benz or my father-in-law did with his Beamer every two years. Both claimed they started to lose value too fast after that. I'm a truck guy and keep 'em forever and a few years after that. I bought this 6.75" stubby rubber antenna when the 30" stock antenna scrapped my garage door all the way in and back out of my garage which left black marks on my white garage door and rubbed all the black paint off the top of the ball tip on the end of the antenna: AntennaMastsRus - The Original 6 3/4 INCH is Compatible with GMC Sierra 1500 (2006-2019) - SHORT Rubber Antenna - Reception Guaranteed - German Engineered - Internal Copper Coil They have models for just about every year, make and model in different sizes, colors, styles and lengths. Looks better and does not rub my garage door, but I'm sure OE antenna has better reception. YMMV This is NOT an advertisement! I have not had it long enough to say how good (or bad) it works really. Please feel free to delete or modify if this does not comply with the rules. Thanks. Yep, read that book as well, good reading. Of course they say 67% of all statistics are made up on the spot. ;) They are making good deals with good incentives on 2018s but don't seem to be in a real panic to sell them off. My dealership said most customers want the 2019s now anyway. I agree, not enough incentives on the new 2019s yet, Jan/Feb had better incentives and rebates than March or April (so far) and I think that will change by May. If not, then whenever (or IF) they release any carbon fiber beds or add Adaptive Cruise Control (ADC) to at least the Denali line. BTW, how do those number compare with Ford F-150 and Ram trucks? I am biased as a GMC owner but I think the Sierra Denali is the best truck you can buy at any price right now against the top of the line 150, Ram, Tundra (if they count) and even Chevrolet. Just my 2.5 cents worth. 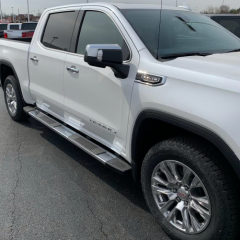 I just bought my 2019 GMC Sierra Denali through the Costco program and it could not be easier. It was the only way I could get any kind of deal in the Ohio area other than same rebates everyone else gets. Laura Buick GMC outside St Louis in IL has great deals and can beat Costco but I get free oil & filter change plus free tire rotate and balance for life through dealership 6 miles from my house that honors Costco deal which Laura does not. The local dealer gave me Costco deal that saved $4,000 plus rebates at the time which were at $3500 total, then agreed to match Laura price, so total price savings was just over $8,000. Costco deal adds 50% off first $400 ($200 max value) in accessories, parts or service within first 6 months, then 15% off everything over the first $400 (dealer gives 10% off for life if you buy vehicle there). Also got another $100 off any accessory with no minimum purchase through a "Shop-Click-Drive" online bonus with the dealership if you purchase vehicle there by 5/30/19. And of course with free MyGMRewards.com account I got 2,000 points for signing up and another 20,000 points for purchasing a vehicle to get a grand total of 22,000 points (worth $110.00) off on any parts, service or accessories. So that's $410.00 off any parts, service or accessories along with another 15% off for 6 months then 10% off after that. I plan to buy a nice Tonneau cover and a couple of other items right away. Here is picture taken day truck arrived and right before I drove it off the lot. Yes, I'm a little proud but gosh darnit I deserved it, besides what good is it if I can't show it off a little here and there, lol. Peace to my truck lovin' brothers and sisters. Couple of friends bought from Laura and got great deals. I got quotes after I knew exactly what I wanted, after speaking with Laura my local dealership only 6 or 7 miles away here in Ohio beat their price by a few thousand dollars plus I get free oil changes, filters, lube, tire rotations and balancing for life. 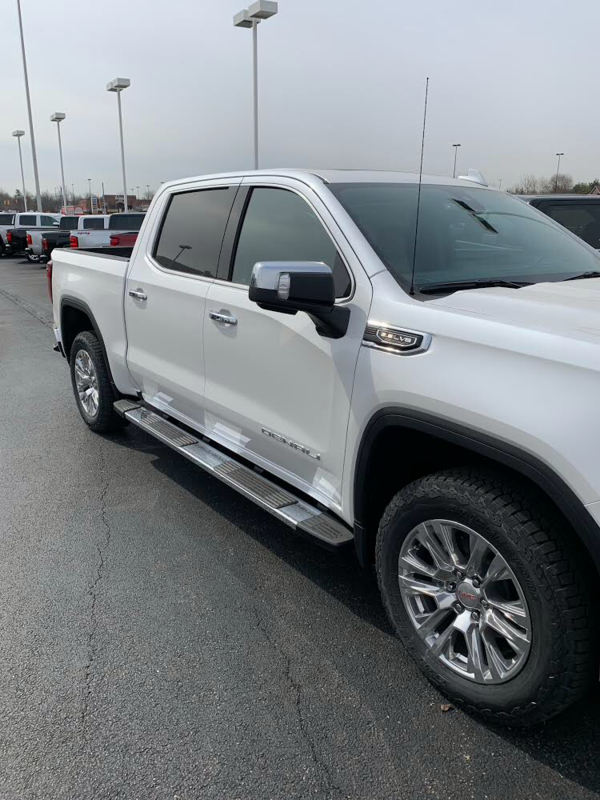 I got well over $10k off msrp and am very happy with my 2019 GMC Sierra Denali. So I bought an extended warranty today. Yes, smaller, local hometown boy done good but outgrown their space and had to completely move the used car business across the road and a little further away. Definitely outgrown their service area. I do feel lucky because I have dealt with the big boys in the past with less fortunate results. Back then I worked on my own vehicles and would never buy or recommend an extended warranty but they have more place today, although I would not pay $3,000 for one.